There will be no meeting this Friday 19th April. The Shipley Art Gallery is open and members can use the workshop to do their own thing if they wish. The next programmed session will be on Friday the 26th April when the suggested subject will be "A Day at the Races". -any races, horse, car, athletics, or even Blaydon! Exhibition at Low Fell Library. The Spring Exhibition at Low Fell Library is now on and continues until Saturday 31st May. The dates for the St Mary's Exhibition have been announced as 5th July to 23rd August 2019. We require 30 entries. Also known as The Gateshead Heritage Centre, St Mary's is the old church between the Tyne Bridge and The Sage. 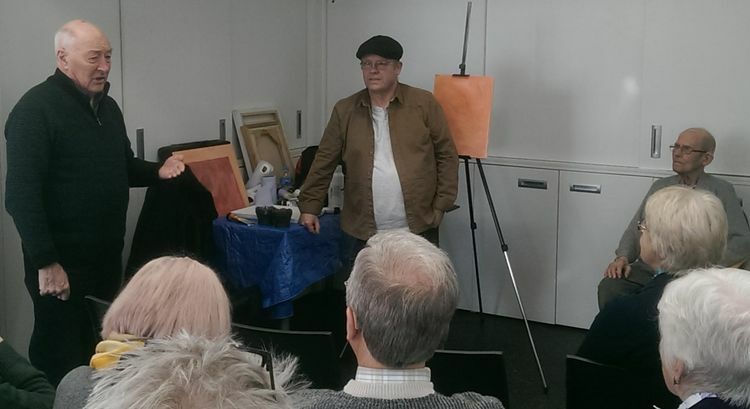 Artist Ted Taylor being introduced to the members by John Fulthorpe prior to his portraiture demonstration at the Shipley Workshop . The "Alla Prima" afternoon of a couple of weeks ago produced 9 entries. The vote was close with Margaret's seascape being chosen by the members as the winner. Mapping Contemporary Art in Heritage Environment: Creation, Consumption and Exchange. -To analyse how contemporary artworks commissioned for these contexts are received and consumed by heritage property visitors. The first meeting took place at the Shipley Gallery on 27th April 2018. The Society's involvement will continue with visits to Gibside, Cherryburn and Holy Trinity Church, Sunderland as part of the study. The study is organised by the University of Newcastle, with the University of Leeds and national and regional partners from the arts and heritage sectors. It is funded by the Arts and Humanities Research Council. It runs from Jan 2017 to Dec 2019 but GAS’s involvement has now ended although we have been invited to attend a conference on the subject sometime next year when the findings will be reported.